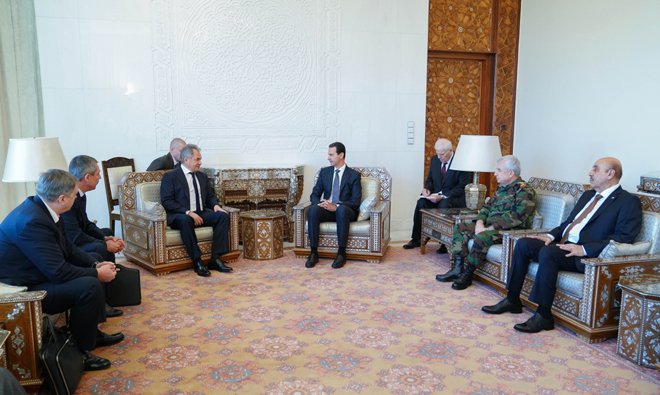 President Bashar al-Assad on Tuesday received Russian Defense Minister Sergei Shoigu and the accompanying delegation. Talks during the meeting dealt with the latest developments of war on terrorism in Syria. 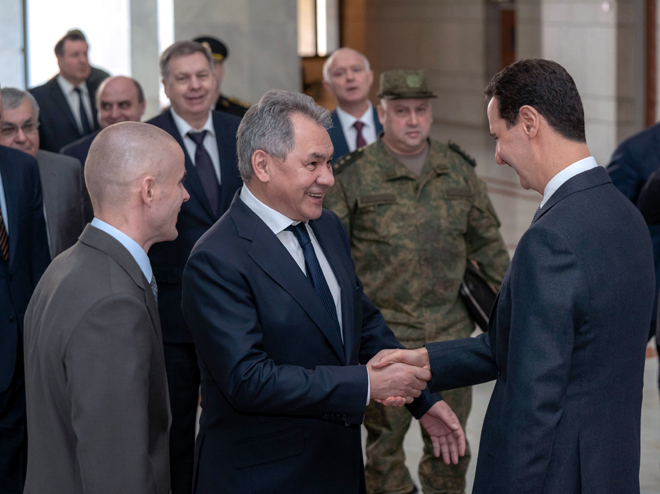 President al-Assad affirmed that the Russian-Syrian joint work and the high level coordination in all fields, on top, in the military and political domains, were one of the decisive factors of Syria’s steadfastness in the face of terrorism and the achievements gained against Daesh, Jabhat al-Nusra and other terrorist organizations. The talks also tackled the situation in Idleb and East of Euphrates regions. Viewpoints were identical on the necessity of continuing the joint work to put suitable solutions to restore security and stability to those regions and adopt probable procedures to not allowing the hostile countries of Syrian people to achieve, through their policies and practices in the two regions, what they have failed to do during the years of crisis. Meanwhile, President al-Assad said that some countries and powers fight terrorism through the statements of their officials only, while they support it and work with it in reality, and they go ahead in offering protection to it in a number of areas, and by these policies, they were the reason behind the big number of civilian causalities and contributed to spreading terrorism and prevailing it in other areas. Minister of Defense, Maj.Gen. Ali Abdullah Ayoub and chief of the National Security Bureau Ali Mamlouk attended the meeting.